What a difference a bean makes! Full of protein and energy, when paired with the monounsaturated fat of avocado, make an age reducing combo that sizzles: RA Factor: 8.3 days younger. Heat a large saucepan over medium-high heat. Add oil then onion and oregano. Cook 3 minutes, stirring occasionally. Add salsa, beans and tomatoes. Cover and bring to a boil over high heat. Reduce heat; simmer 25 minutes. Ladle into bowls; top with avocado and cilantro. 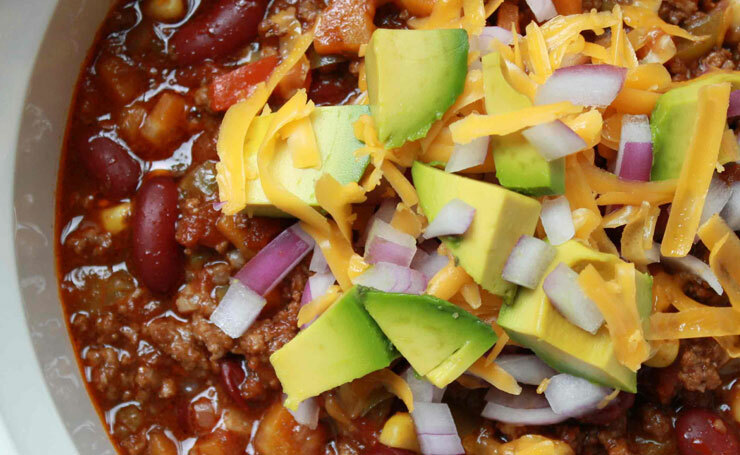 Leftover chili may be covered and refrigerated up to 3 days or frozen up to 3 months. The chili may be drained or cooked uncovered to thicken and used as a burrito filling. Fresh Italian flat leaf parsley can be used instead of cilantro for those who prefer the bright clean mineral flavors of parsley to the perfume and pungency of the Mexican herb (but cilantro is as cheap and as available).